Turbo Controller | Tennessee Aircraft Services, Inc.
As I assist CPA members and my own shop’s customers with various Cessna airplane troubleshooting problems, the turbocharger system is by far the most common issue. I don’t think it’s all that complicated or high tech but does have many possible fault points that can be difficult to isolate at times. One of the first troubleshooting tools is the critical altitude test which defines the performance of the complete system. There is a common misconception that all Cessna single engine Continental turbocharged systems have the same limits, but that’s not the case. I’m not truly an engine expert, but experience has forced me into a certain level of education. A recent email from a friend reminded me of the importance of following instructions instead of relying on memory. The email came from Chuck McGill and forwarded information from one of his clients. Chuck is one of the most knowledgeable 210 series flight instructors in the country and often helps buyers find good 210s to purchase. A client of his, Greg Drew, had purchased a beautiful P210 and promptly ended up dealing with a turbo system problem. In the course of resolving the problem, Greg learned more about the Continental turbo control systems in the P210 series than he wanted to know. He put that education in writing and passed it on to Chuck who forwarded it to me. This article contains Greg’s research, as well as some extra of my own, and his efforts are greatly appreciated. Also, thanks to Greg, we’ll explore some of the variations of this system and why it’s important to go to the appropriate service manual for your specific model turbocharged plane for operational specifications when doing performance checks and troubleshooting. For higher engine power and/or higher altitude engine operation, a method is needed to compress air into the engine induction system. For these Continental engines we use the exhaust energy to spin a compressor turbine which is connected to another turbine that takes ambient air and pressure feeds it to the engine. At lower altitudes the system is capable of over-pressurizing the induction system. To solve this problem, a wastegate valve is installed to open as needed allowing excess exhaust to exit the system. This reduces the exhaust pressure available to the turbo causing a corresponding reduction in induction manifold pressure. Regulating the position of the wastegate valve is a key component in this system. The wastegate has a hydraulic piston that uses engine oil pressure to open and close the wastegate valve. The pressure to this piston actuator is regulated by a controller that limits the oil outlet from the actuator. When the engine starts and is running at very low power, the controller closes off the oil outlet of the actuator, causing it to close tight, diverting all exhaust pressure to the turbine. When the engine oil is cold, the response time of the actuator is very slow, causing the typical overboosting common on the first flight of the day. If less manifold pressure is requested, the controller opens a bit to allow some of the oil to flow out of the actuator and open the wastegate as needed. Getting the controller to maintain a given setting is done by attaching an air pressure reference line to the controller. 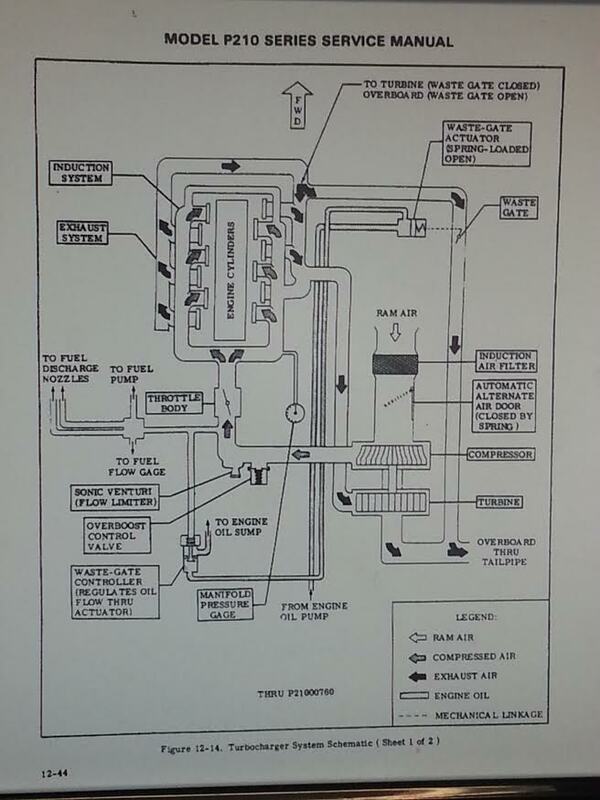 This reference line is connected to the “upper deck”, the part of the induction system between the turbocharger compressor and the throttle valve. The controller comes in a couple of different versions. One includes a second reference line that goes to the manifold pressure downstream of the throttle valve. The end function is still the same, but the performance results do vary. This is where the misconceptions can cause endless trouble shooting for a problem that may not exist. A common turbocharger system performance test is the part-throttle critical altitude test. The T210 and P210 service manuals all have a section 12A Turbocharged Powerplant that details the controller and turbocharger operational flight check. The legacy T206 has similar sections in their service manuals. Without getting into the details, the test begins with takeoff and climb at specific engine power settings and climb speeds. The controller should maintain a specific manifold pressure without further adjustment of the throttle up through a given altitude. The altitude at which the manifold pressure begins to drop at one inch per 1000’ feet of climb is the part throttle critical altitude. Most pilots have in mind that 17,000’ is the normal critical altitude for all turbocharged 210s. This is almost correct, but not quite. To find the correct part throttle critical altitude for a specific model Cessna, the appropriate service manual must be consulted. The test procedure varies somewhat between year models in several points. Some call for 75% power settings and others 80%. There are performance variations for standard and nonstandard air temperature. A 20 degree F temperature difference can change the expected critical altitude results by 4,000 feet or so. Some systems have a standard critical altitude as low as 9,000 feet while others exceed 20,000 feet. There’s no telling how many hours have been spent troubleshooting turbo problems that didn’t actually exist because a system was being tested to the wrong baseline. We’ll look at some of the major changes through the turbo 210 series just as an overview. Beginning with the 1966 Turbo 210, Cessna used an “absolute pressure controller” that only referenced the upper deck pressure. The part- throttle critical altitude should be above 20,000 feet at 75% power and standard temps. This minimum performance specification held through the 1977 model T210. The service manual for 1977 through 1984 T210 shows an absolute controller is still used, but the part- throttle critical altitude is shown as a minimum of 21,000 feet. See the diagram on the following page. The P210 series is even more varied. Early P210 through serial number 760 still use the absolute pressure controller. There is a Cessna service kit, SK21098B, which installs a different turbocharger on P210 serial numbers 001 through 690. Without this kit installed, the part-throttle critical altitude should be a minimum of 21,000 feet. After kit installation, the part-throttle minimum critical altitude is down to 9,000 feet. P210 serial numbers 691 through 760 came from the factory in this modified configuration. Beginning with P210 serial number 761, Cessna changed to a sloped controller. The sloped controller adds a reference line to the manifold deck pressure. This controller reacts to the pressure difference between the upper deck pressure and the manifold pressure instead of waiting for the upper deck pressure to reach some predetermined limit. This newer system has a part-throttle critical altitude of 18,000 feet. In all these variations of critical altitudes, the ultimate service ceilings remained the same. 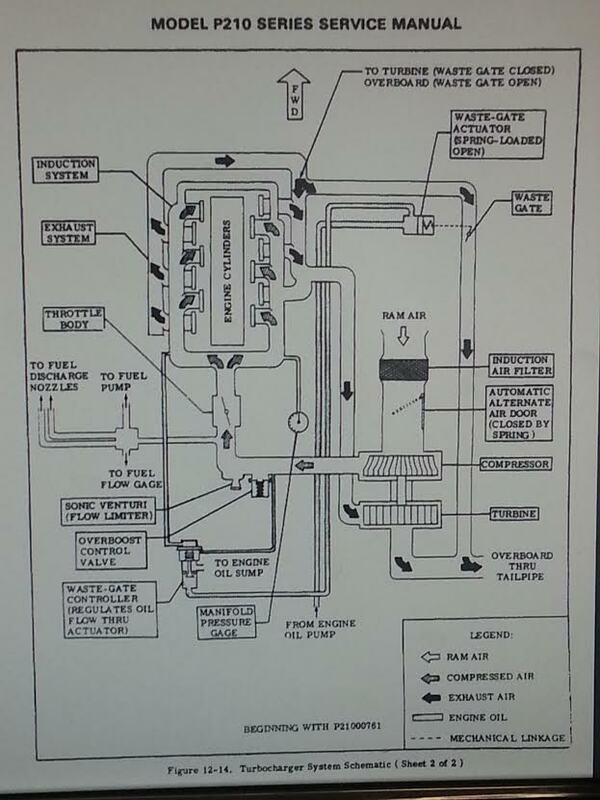 The only real change is the pilot must begin adding throttle in the climb to maintain manifold pressure. The same goes for manually reducing the throttle in descent. There’s an assumption that all this testing is being performed to isolate a system fault. To that end, one should be reminded that even the best controller can’t mitigate a fault elsewhere in the turbocharger system. A leak in the exhaust system will limit the energy needed to spin the turbocharger, resulting in lower critical altitude. Similarly, leaks in the induction manifold lower the ultimate pressure to the cylinders and lowers the critical altitude. A mechanically stuck partially open wastegate would present as an exhaust leak. These and other issues should be considered before assuming the controller is at fault. There isn’t a one size fits all for the controller and turbocharger operational flight checks. The required airspeeds, RPM, fuel flow and manifold pressures will be different depending on your specific aircraft model, serial number and service kit installation. Outside air temperatures have a very significant effect on the tests as well. Before a turbo controller or any part of the system is condemned for not doing its job, be sure the correct baseline performance specifications are used. There’s no reason to throw extra time and money at a problem that may not exist.